Small bedrooms are difficult to design and remodel, because however much you try, you just can’t do away with the one essential piece of space-occupying furniture, and that is the bed. Now just because you have included a king-size bed in a small space, that doesn’t mean all your interior decor plans have to go for a toss. As a matter of fact, there are plenty of creative ways to add a sense of space, while making the room look stylish. By following a set of perfect bedroom design hacks and color schemes, you can transform a dull, space-compromised bedroom to one with character and sense of spaciousness. Here is a compilation of great ways to make your small bedroom look bigger. Enjoy! 1.Unclutter the space and Keep it simple. A clutter-free bedroom is the key to perception of space. It makes a small room appear airy and welcoming. 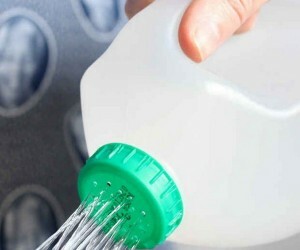 To begin with, get rid of any unnecessary piece of furniture. Note down all those items that do nothing to enhance the character of the room. Opt for organized storage wherever possible. Keep your clothes in the wardrobe, your pennies in the piggy bank, books in the shelf and pencils in the jar. Additionally, consider substituting a sofa set for a space-saving ottoman. Overall, the essentials of every bedroom is the bed, a side table or two, table lamps, window drapes and a rug. That’s it. Keeping the bedroom clean and organized will make it visually appealing and seem bigger. One great way to make a small room look spacious is by eliminating any unnecessary furnishings. After all, a king-size bed, floor-length drapes, a side table or two and a compact cupboard are basically all you need. The illusion of space gets enhanced when you opt for a black-and-white color scheme. The presence of a single painting in the central point of the wall grabs all the attention and get rid of the need for additional room decor. Your bedroom is the place to relax at the end of a long, tiring day. It certainly isn’t a place to get your wheels spinning, so go for more light or pastel colors for the walls, ceiling as well as the furniture. 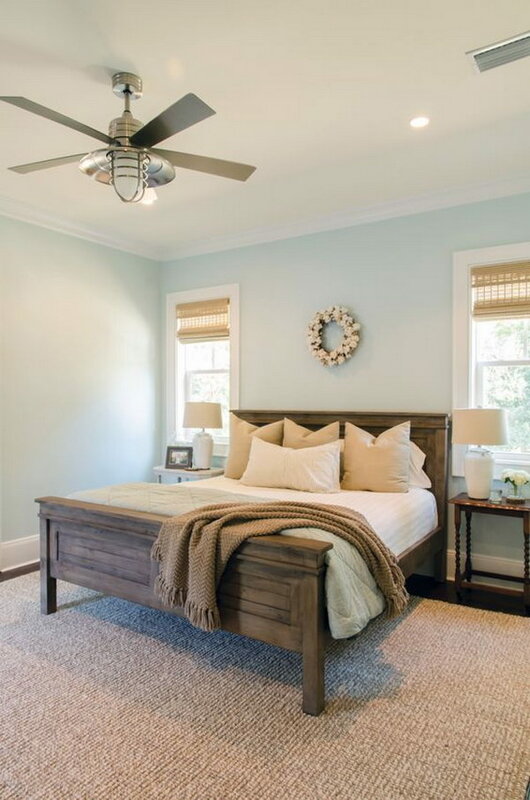 An overall light color scheme will add a quiet air and help you sleep better. Needless to say, light bedroom colors also give the illusion of space. Light shades for the walls and ceiling are great solution to diminish the dilemma of space shortage in your bedroom. Light colors open up the space visually and bring in lots of natural light inside to illuminate both the space and your mood. If you are a fan of dark hues, use them in clever ways. Dark colors will blur the corners, especially when you use too much of it. When you paint a small room a really dark color, the corners seem to disappear and you can’t see the boundaries of the space anymore. This will blur the corners and make your room look cozy, inviting and yet bigger than it is. Dark colors definitely add oodles of personality to a space, but usually they do nothing to make a room look spacious. In spite of being design-friendly, they are not a safe choice for the bedroom. You will be surprised at how spacious your little bedroom looks just by opting for pale colors like white, cream, blue and grays for the walls and ceiling. And, if you just hate to leave the walls plain white, you can always decorate one of them with an array of paintings. Don’t overdo it though. A bedroom with pastel shades and minimal decor looks light, airy and open. via source. 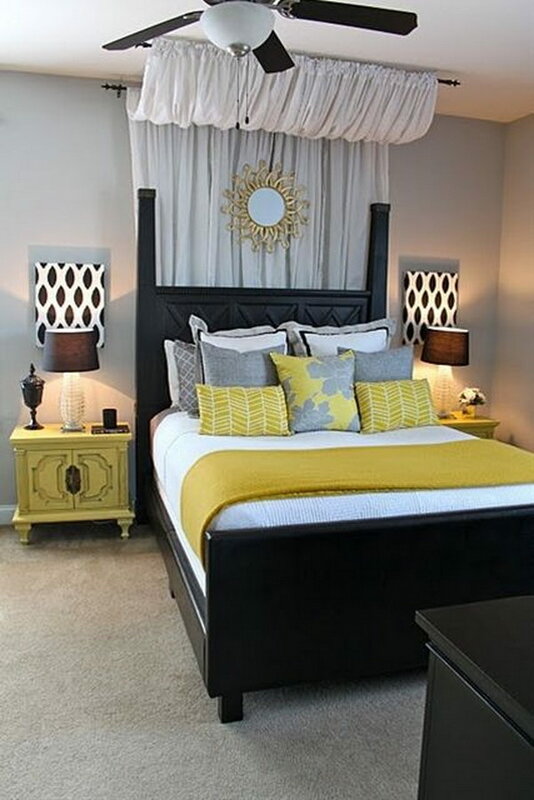 Black and white bedroom is in vogue; contrasting colors create impact and drama in the area. Black and white seems to be trending these days, and it’s not surprising, considering the dramatic touch it lends to every space. This bedroom here is the perfect example of a contrasting color code that fascinates the eye, while giving the illusion of space. A matching wall art is better than a heavy painting for this room. 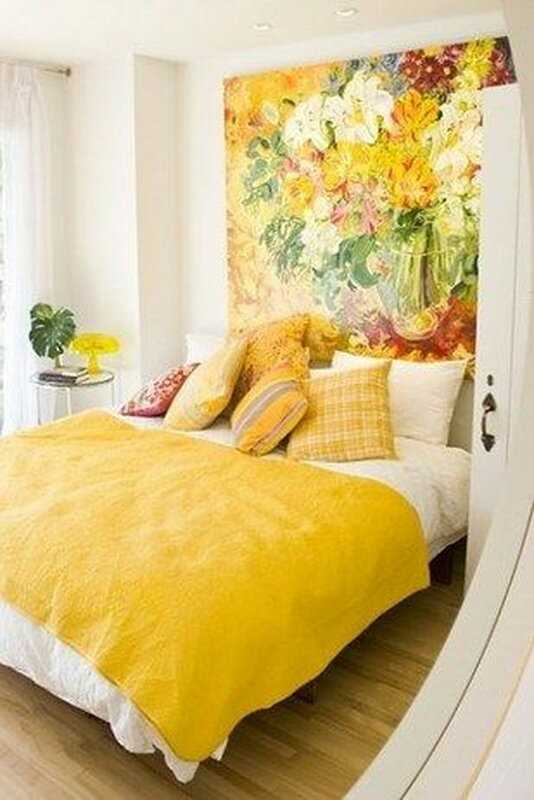 This is a great idea about how to use colors to make your bedroom appear larger. The black and white colors create layering and depth. Ensure the colors to coordinate with each other. When you use different shades of the same color for the wall, rug and furniture, you tend to create a sense of unity all throughout. The sense of visual coherence makes the space in a small room more open. 3.Use stripes to elongate the space. Stripes can dramatically alter the shape of a room. Basically, narrow vertical stripes in soft or pastel colors make a low ceiling appear much taller than it actually is. You can simply paper the walls or paint the stripes on the walls yourself. 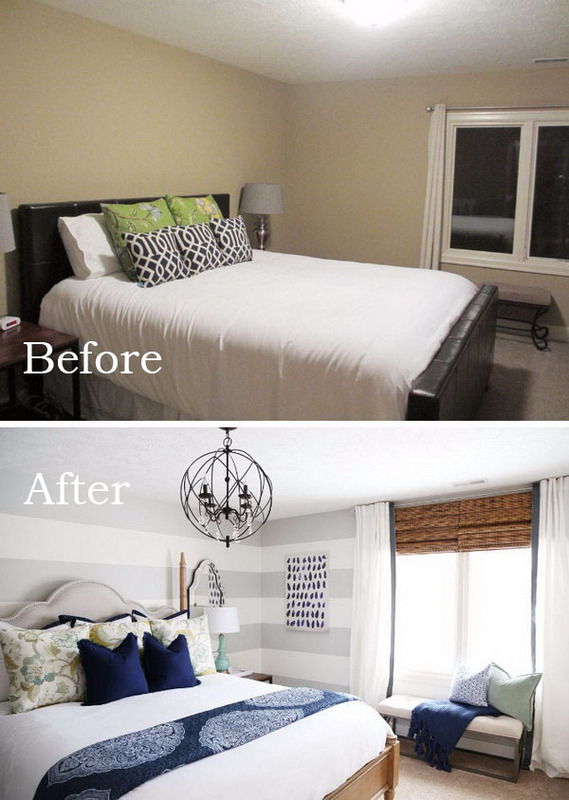 If you wish to visually elongate your bedroom, use horizontal stripes on the walls. Stripes have a repetitive appearance and enable the viewer to perceive the room as taller with unending stripe patterns. This idea works even better when you pair it with a light colored backdrop. 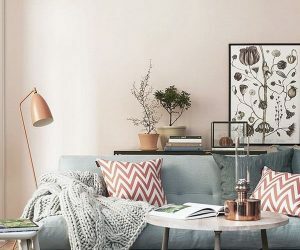 Additionally, you can experiment with different color combinations to ensure that the stripes match the wall paint and the existing room decor well. This is a clever idea for making a bedroom look larger. Basically, you need to think of your room as a huge painting, where the lines of movement should be coordinated all throughout. If you have horizontal lines everywhere and then suddenly a vertical patch thrown in the middle, it interrupts the flow and makes the room look smaller. So, you can use either horizontal or vertical strips, but don’t use a bit of both. As in this example, the bedroom clearly lacked personality before the makeover, and looked like it could do with some fresh paint and character. A simple design of horizontal, gray strips on the walls helped to combine all the segments of the room in a unified whole, thereby giving the effect of space. via source. It’s a known fact that a low ceiling makes a room look smaller. 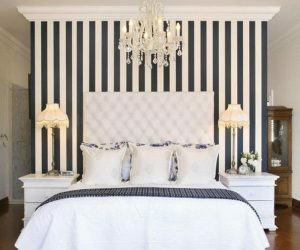 If your bedroom has a low ceiling, you can counteract the space-constrained effect of a low ceiling by using black and white vertical stripes for the wall. The bedroom pictured here actually has a smaller ceiling, but thanks to the wall decorated with black and white vertical stripes, it looks much larger and airy than before. 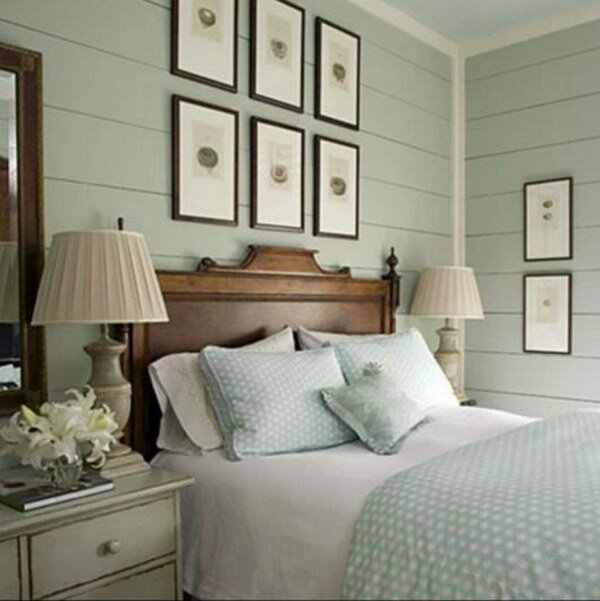 Beadboard walls in light tones like sea green or pale gray create a sense of space and unify the room’s look. This is a pretty minimalistic way to decorate your small bedroom as well, without running into the risk of cluttering it up in the process. 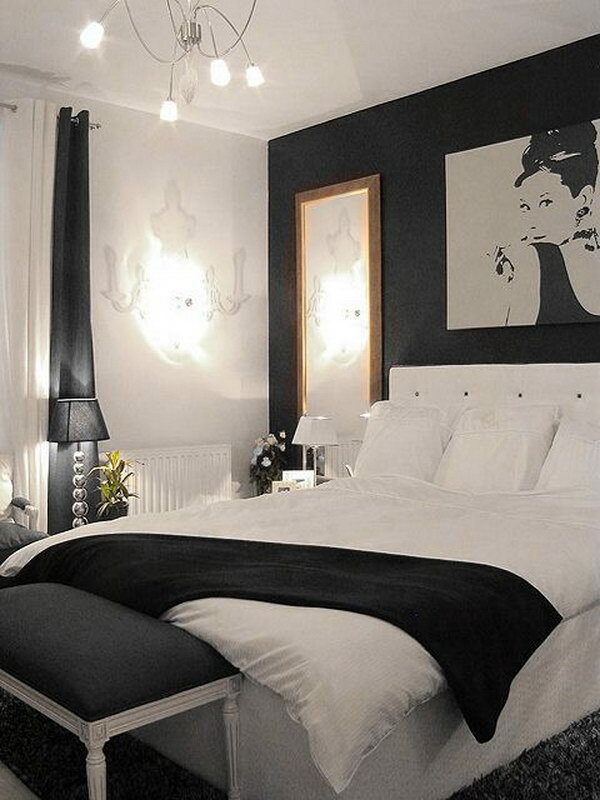 Use of monochromatic paint colors throughout the bedroom gives the illusion of fluidity and space. 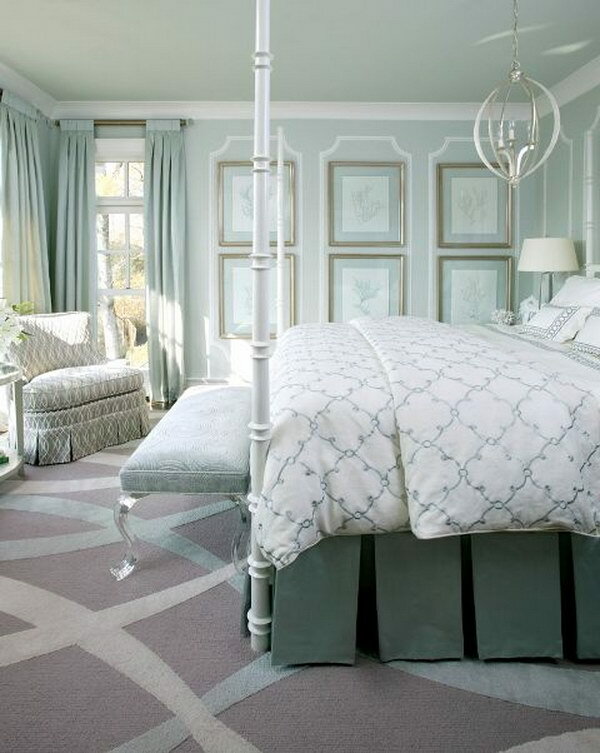 The small bedroom pictured here uses Robin’s Egg blue shades to mimic the flow of color. In the bedroom pictured here, a combination of striped walls, beadboard and the elegant beige-and-white curtains go a long way in making a small bedroom look bigger. 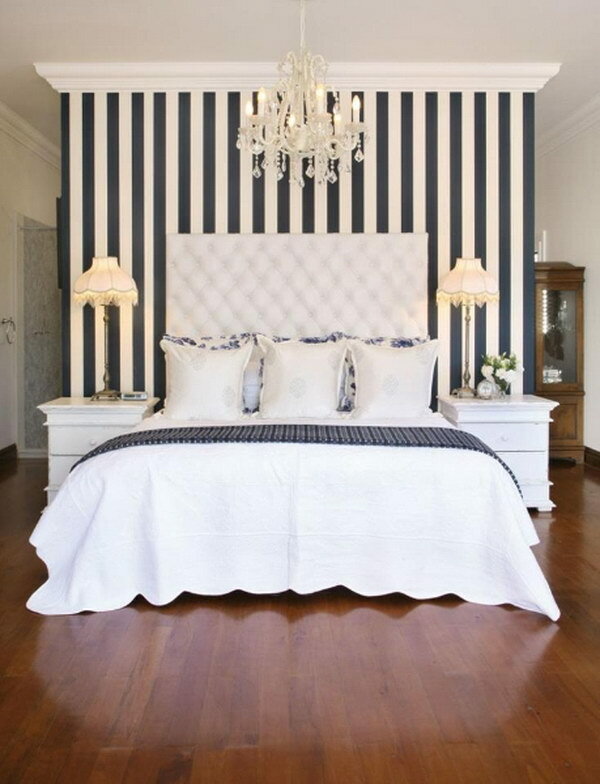 Horizontal stripes visually widen a narrow bedroom, while vertical strips give the appearance of a taller ceiling. Like in the example given here, the room looks a lot more spacious, open and large just by using strips on the walls. The choice of white colors for bed sheet further enhance the effect of space and create a unified look. via source. 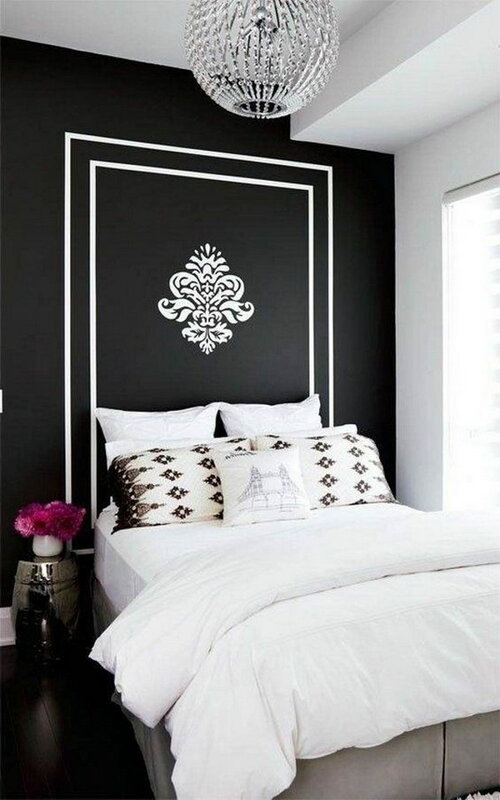 One great way to shift the focus from the shortage of space in a small bedroom is by experimenting with wall decor. 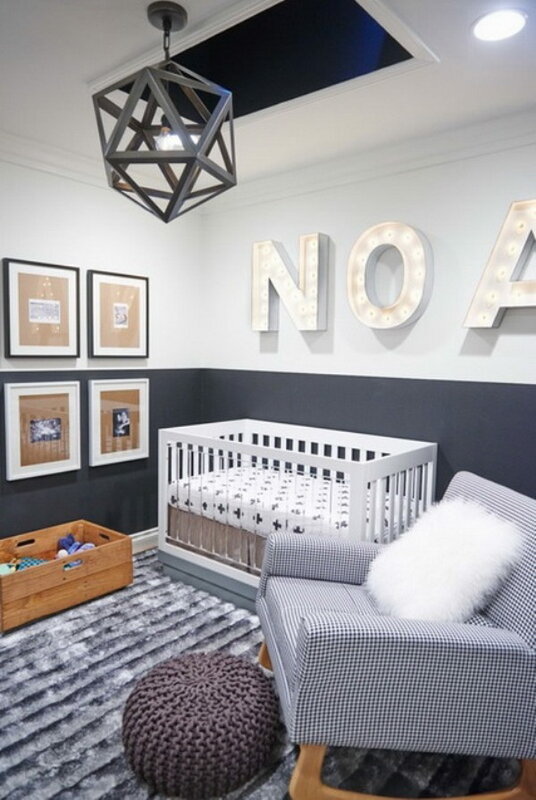 This DIY herringbone chevron wall is a creative decorating idea and it give an exaggerated effect of space to your room. 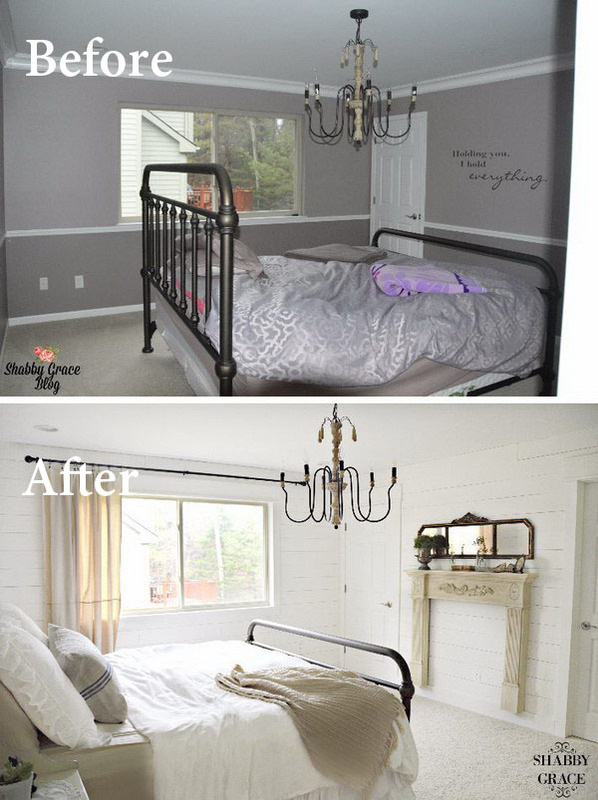 The bedroom looks pretty space-constrained prior to the decoration, but after a little makeover to the walls; it adds drama and personality so much that the space shortage doesn’t really catch the eye. source. A dark ceiling creates a sense of depth and adds structure to the room. This is a novel way to trick the eye into believing the room has a taller ceiling and is, hence larger than it actually is. 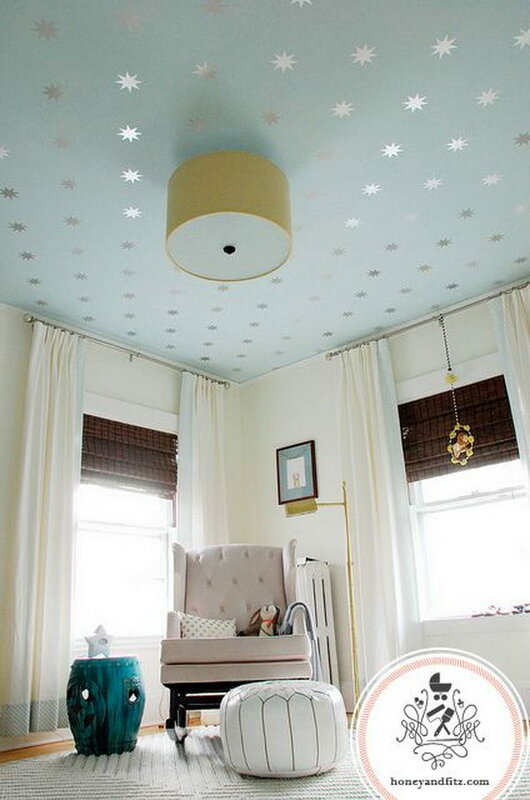 You can use bold patterns for the ceiling or decorate it with a sparkling piece of fixture for the ultimate glamour. It doesn’t matter whether your bedroom has a high ceiling or not. Using colors and patterns that pop will draw the attention upward, and give the illusion of height. For example, you can paint the ceiling in such a way that it mimics the midnight blue sky. However, make sure the walls are more or less of the same hue as that will help to erase the borders that visually define the space. Even if your bedroom doesn’t have a high ceiling, you can still opt for colors and patterns that shift the focus upward and give the illusion of height. 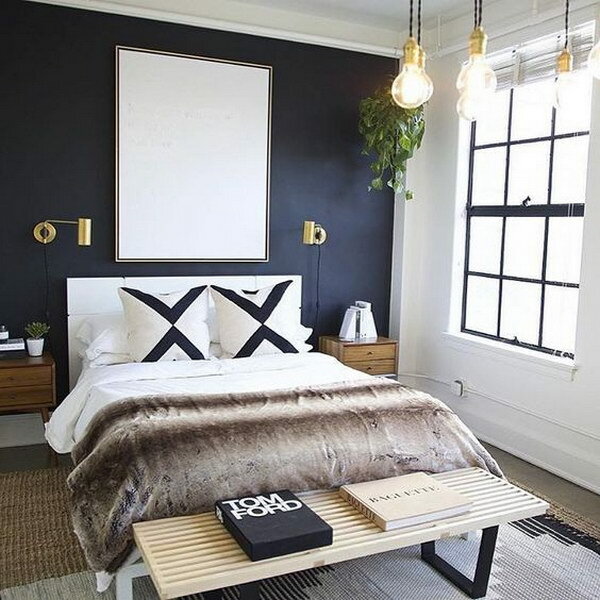 This bedroom looks dramatically spacious by simply using black paint for the ceiling. It is quite an interesting technique, as you are tricking the eyes of the beholder to look upwards. While pale colors open up a room, dark ceiling creates depth and makes the room look larger than before. via source. The wallpaper does exactly what dark paint does to the ceiling and makes it look taller. Keep in mind though, that wallpaper in pastel shades and dreamy designs are more appealing visually, as dark shades of wallpaper look rather high-brow and intimidating. After all, the mood of a bedroom should be kept calm and serene. In this bedroom, the floor-length curtains together with the wallpapered ceiling shift the focus upward and give the illusion of space. If you are not fortunate enough to have a floor-to-ceiling window in your bedroom, you can still give the illusion of this by mounting long curtains above your window frame or against one of the walls. This helps to draw one’s eyes upwards, thereby making the ceiling appear higher and the room larger. 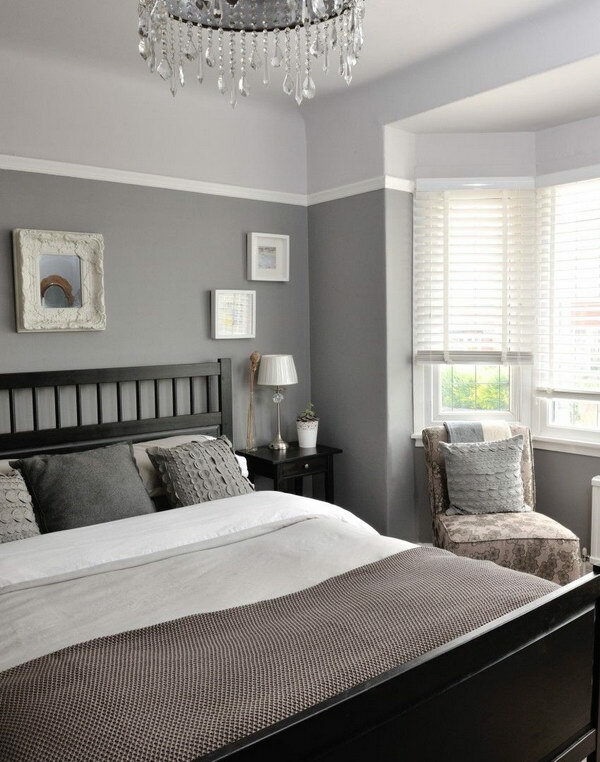 Monochromatic paint is a sensible choice for the walls and ceiling of a small bedroom. Use a single paint all across the room, right from the wall and bed sheet, to the table lamp, drapes and ceiling. It helps to create a smooth flow of color that is both visually appealing and makes the room look expansive and airy. Basically, when you paint the entire bedroom with contrasting colors, you tend to segment off portions of the room, thereby allowing the viewer to easily judge the dimensions of the room and perceive it as a space-compromised. One of the easiest ways to create the effect of space is to use light colors, preferably white all throughout the room. Like in the bedroom pictured here, a white ceiling angled against white walls tricks the eye into believing that the room is airy and large, even if it’s not. On the other hand, when the ceiling and walls are of contrasting colors, it becomes easier for the eye to tell the dimensions of the room. via source. Coordination is the key feature of home decor and the first place to begin is the paint. Monochromatic paint colors, especially the lighter colors help to blur the borders of the walls and ceilings. By doing so, they prevent the eye from sensing the actual dimensions of the room, as the eye views the entire room as a single, large unit, rather than observing the small segments individually. 6. Two-toned walls can add dimension to a space. Dark-colored walls can add drama to a space, but sometimes they tend to highlight the parameters of the room and thus give away the fact that the room is space-constrained. Therefore, instead of opting for dark shades on a full wall, go for a two-toned look, which can be achieved by simply coordinating a dark-and-light color for the wall and ceiling. When you paint the walls a lighter shade than the ceiling, you segment the bedroom into portions. This exudes an exaggerated illusion of space and also makes for a novel and sophisticated look. Incorporating this simple technique in your small bedroom will make it look like the walls are located farther away, thereby giving you a bedroom which appears larger. A small strip of a light color on top of a darker shade will still add visual height to the ceiling and dimension to the room’s decor. Optical illusion is the basic premise behind any technique aimed at giving the effect of space. Painting the trim a lighter color than the walls creates an optical illusion, enabling your eyes to perceive depth. Using this simple trick in a small bedroom design will add visual height and dimension to the room. A black-and-white color code not only adds character to a space but also makes it look visually coherent and spacious. This bedroom incorporates a contrasting interplay of dark and light colors in order to trick the eye into perceiving the bedroom as taller and larger. The inclusion of a dark colored square on the otherwise plain, white ceiling creates a virtual sense of height. 7. Go for mirrored furniture. Using a mirror to double your room’s space visually is a trick that’s been used for centuries. You can add mirrors to your small bedroom in many creative ways. For example, you can add a decorative mirror on a bare wall or the door, or you can utilize an assortment of small mirrors to make your room look larger. Mirrors basically reflect light and the reflection creates an optical illusion of space. This effect is heightened when you use mirrors from floor to ceiling or from wall to wall. Another good idea is to replace your regular closet doors with mirrored ones. This gives a wider sense of space. Mirrored wardrobe doors are an elegant and clever choice for small bedrooms. They enhance the feeling of space, especially when the color scheme is white, as mirrors reflect light colors like white. So, while the overall color scheme remains the same, the sense of space is enhanced. In this bedroom, the incorporation of two floor length mirrors as anchors for the king-size bed helps to create an exaggerated sense of space. They blend perfectly with the ceilings to virtually enhance the space of the room and make it look larger. Mirrors are after all transparent, and hence widen the room visually without looking too congested with their presence. A combination of white color scheme and mirrors can go a long way in creating an optical illusion of space. In this bedroom, the mirrored side table door as well as the mirror wall art gives out a spacious and light air elongates the room visually. via source. 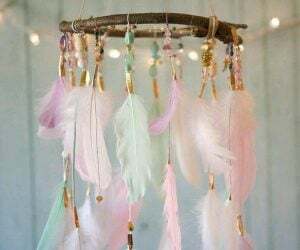 8.Create a focal point in the bedroom. Too much going on in a room makes mess and kills a sense of spaciousness. When you create a focal point in your small bedroom, you basically take the attention from the obvious space shortage and add structure, depth and personality to your room. There are plenty of ways to accomplish this. You can paint one wall in darker color than the surrounding walls or decorate it with luxurious pieces of art to heighten the drama. Alternatively, you can hang an oversized piece of bold art on one of the walls, preferably the headboard wall, so that it grabs the viewer’s eye. Instead of a gallery wall, go for a bold piece of art for your room. Get inspired from the bedroom pictured here. The simple addition of a glamorous and creative art for the walls gives depth to the room, thereby making it look expansive. via source. 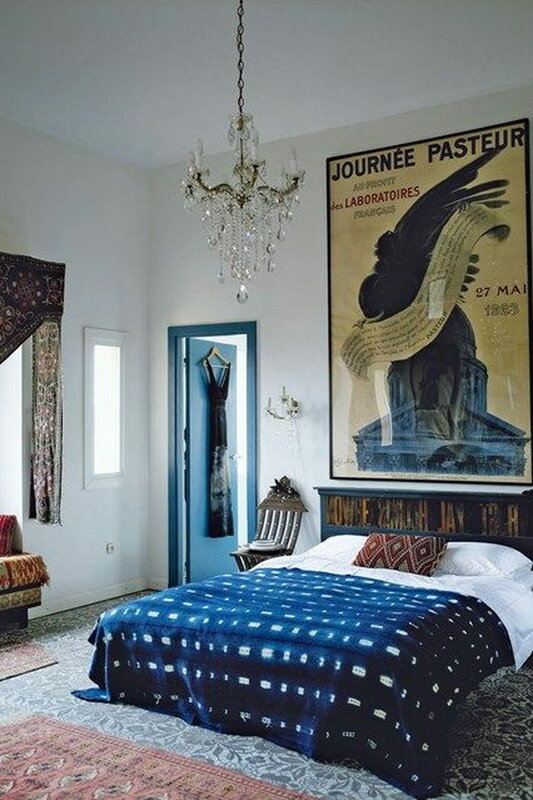 Just because your bedroom is small, that doesn’t mean it cannot be dramatic. Oversized pieces of art can give a lot of drama to a space-constrained room and make it appear bigger than it is. Instead of using a mix of photos and paintings for the walls, choose a single piece of art, which reflects your personality and enhances the peaceful style of a bedroom. Canvas prints are a great selection too. This trick works surprisingly well for studio apartments. A single wall of darker color than the adjacent walls adds a sense of depth, thereby forming the sole center of attention and giving the illusion of space. This bedroom express spaciousness and elegance like none other. The charming wall mounted headboard together with the matching white bed sheets create a unified look and all the delicate details add luxury to the space. Another great way of creating a focal point in your small bedroom is using wallpaper for the wall. Instead of cluttering the main wall with random assortment of art pieces, opt for bold wallpaper. 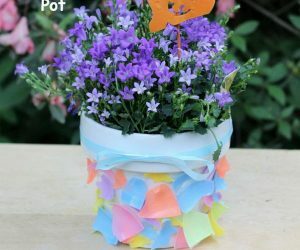 This will help to fill the room and draw attention away from the room’s size. Additionally, it also lends character to the space and looks glamorous as well. via source. In this grey and white bedroom, a serial display of framed paintings on the grey wall grabs all the attention and creates a sense of depth and structure in the room. Blinds are almost always your best bet when choosing curtains for your space-constrained bedroom. 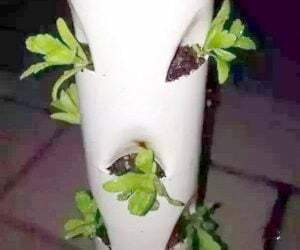 They are compact in appearance, occupy less space and functions exactly like curtains to let in light and ensure seclusion from the rest of the world. Another sensible choice is classic panel curtain, which can be mounted on curtain rods set close to the ceiling for a heightened effect of length. This works well for rooms with a low ceiling. Sleek, floor-length panels grab the attention upward and create a long, unbroken line of sight, thereby giving the illusion of height. Avoid heavy curtains in small bedrooms, as they give the room a crowded feeling. It is advisable to opt for vertical, light colored curtains with contrasting vertical strips. This trick works well to add height to a small room. Blinds take up less space in the window while letting in more light, but with the same amount of privacy as curtains. You can always use blinds instead of drapes to create an uncluttered look and make the space virtually broad in the process. Blinds are compact and take up less space, while serving the same function as curtains to allow light inside and ensure privacy. 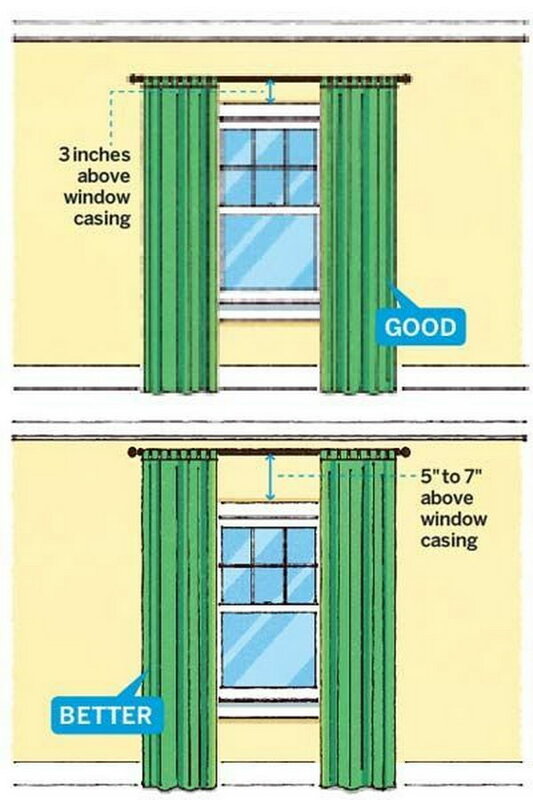 When you utilize curtains longer than the window casing, the room looks expansive and spacious. You can also try vertical stripes as the lines will visually elongate your walls.source. Although you may wish to keep out the bright sun rays early morning, the natural light will expand the room’s sense of space. When you pair this up with mirrors and light colored walls, you’ll notice a phenomenal difference. If you do need drapes at all, steer clear of dark hues. The most effective way to make your bedroom appear bigger is by making use of light colored curtains like the ones shown in this bedroom. 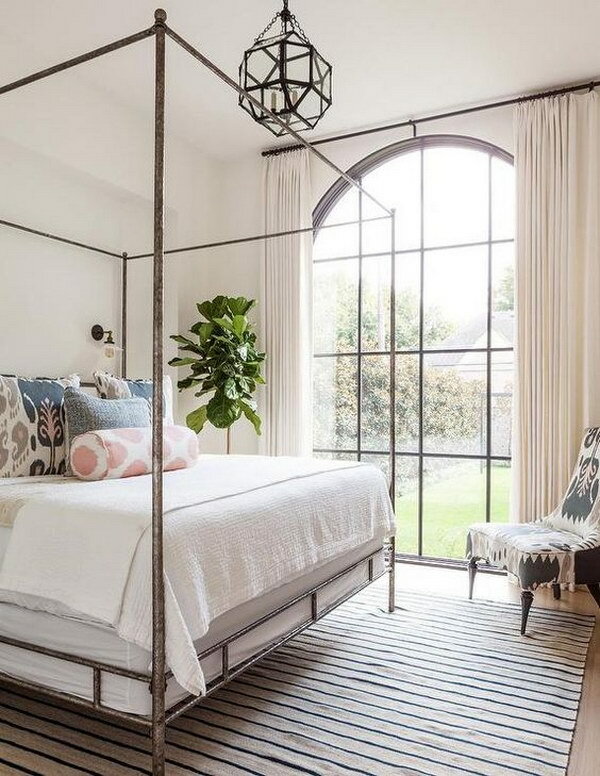 Using wall curtains to frame the bed is a clever way of making the room taller than it is. 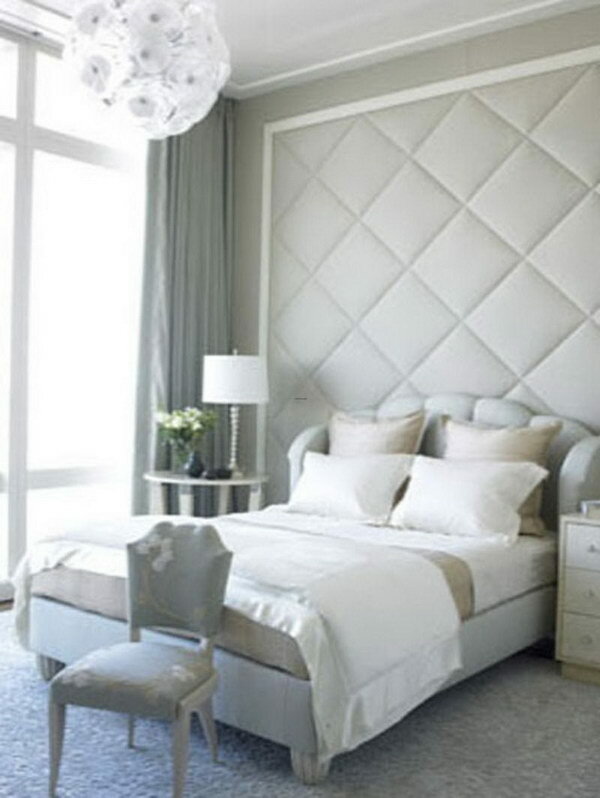 This trick works particularly well for a bedroom with a low ceiling, or a bedroom that is wide but short. Hanging curtains like the ones shown in this bedroom create a unified effect from floor to ceiling, thereby adding structure and depth to the space. via source. 10.Patterned rugs can be an effective way of creating a strong impact in a little room. A plain and simple rug will serve the purpose all right, but do nothing to add a sense of bedroom space. And when you engaged in remodeling your small bedroom to make it look bigger, you will surely want to take note of every detail. So, while the bed, walls, ceiling and ottoman form the key ingredients of decor, you cannot forgo the rug which envelopes the major part of the walking space. When choosing rugs or carpets for your small bedroom, opt for the striped ones, especially when the stripes are in a contrasting color code that matches well with the overall color scheme. Basically, striped rugs create a sense of unity and visually expand a room. A rug pattern with small repeats elongates the line of sight and makes the viewer feel like the space is never-ending. When choosing rugs, go for dramatic patterns. Ensure to coordinate the shapes and colors with the furniture pieces around, in order to match the overall flow of the room. A zebra-print carpet is a unique way to liven up an otherwise dull, black-and-white color scheme. via source. Stripes on the rug have the exact same effect as stripes on the wall. A striped rug can do wonders to make the floor look wider than it actually is. 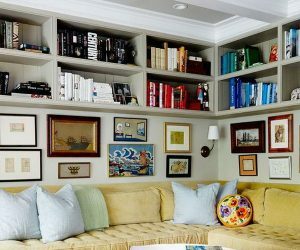 Built-in shelves have a dual purpose- they pose as a great option for storage, and even add length to a room with low ceiling. A classic in-built shelf doubles as a wardrobe, just as well as a support for resting table lamps and other artsy stuff. It is advisable to stick to shelving that is below 12-inches in depth. 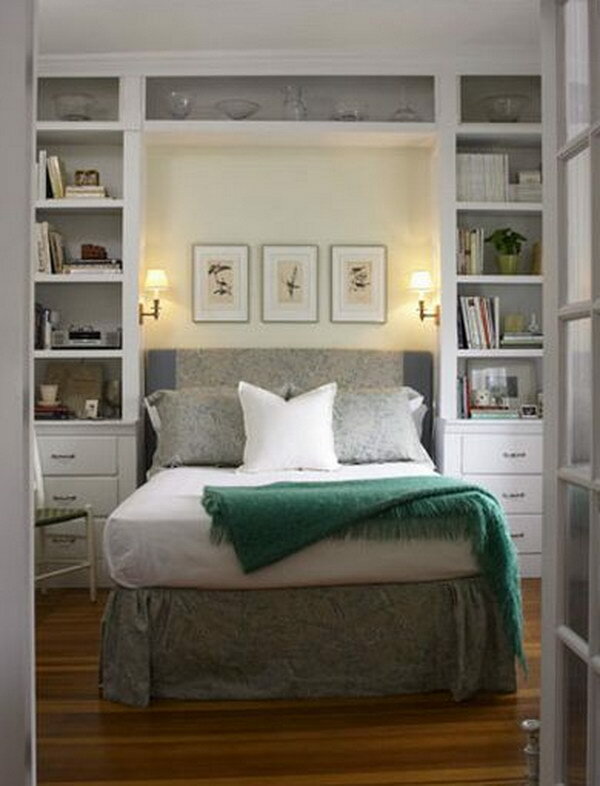 Appropriate use of shelving recesses the bed and prevents it from utilizing too much floor space than needed. This gives out the effect of a wider room. Built-ins are compact and occupy a tiny footprint, as compared to freestanding pieces of furniture. Moreover, they blend well with the surrounding architecture and make the ceiling appear higher than usual, by creating an uninterrupted line of sight from the roof to the floor. A built-in closet is a functional, space-saving piece of furniture. It acts as a great substitute for a wardrobe and doubles up as a stand for the table lamp as well. A built-in closet is also a great add-on for space-constrained bedrooms, as it lends a sense of depth in the wall, thereby making the room look and feel larger. via source. Maintaining an eye-catchy focal point in the bedroom is a great technique to shift the attention from the obvious lack of space. Like in the example given here, an array of built-in cabinets help create a sense of spaciousness. When your bedroom is way too small and all efforts to create the illusion of space seem futile, you can add built-ins to create a seamless look for the room. 12.An attractive hanging light fixture or the sparkle of a chandelier can bring a small space to life. 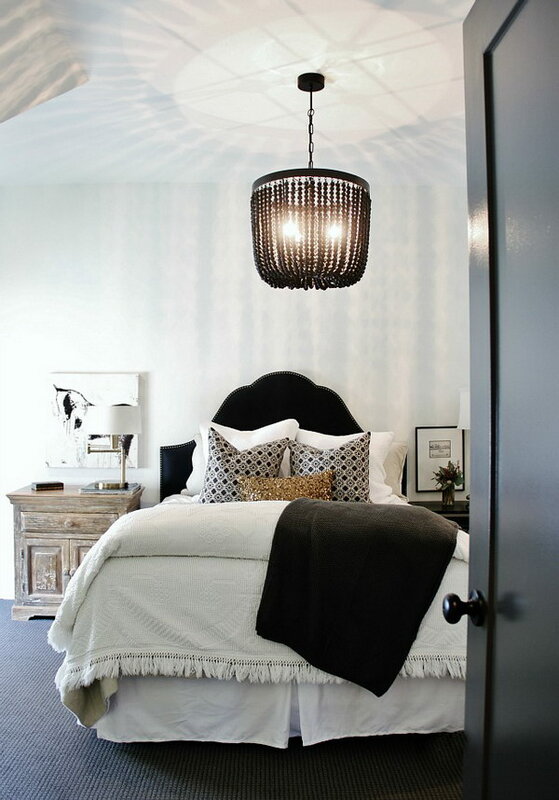 A luxurious light fixture on the ceiling does much more than just giving a glamorous touch to a regular bedroom design. It livens up a small space and brings a lot of warmth, which is a necessity for the bedroom: a spot of relaxation. When in doubt about the chandelier, go bigger. An elaborate, asymmetric and glamorous light fixture makes the space visually appealing and adds character to the room. Hanging light fixtures work best on narrow rooms with tall ceilings. They balance the dimensions of the room and fill up the extra space on the ceiling height. A light fixture doesn’t just add detail to the ceiling, but also lends a beautiful contrast and shifts the entire focus to the ceiling. Look how the light from the beaded chandelier creates another dimension to the room with the flip of a switch! An elaborate crystal chandelier for the ceiling seems like an ideal choice to jazz up a dull color scheme and give a sense of length in the bedroom. Basically, a Faux Capiz shell chandelier like the one in the bedroom pictured here, adds an extra layer to the room’s height, thereby making it look larger than ever. After all, a combination of white and light is the ultimate trick to make a space look bigger. Chandeliers don’t have to be well-shaped and glamorous always. A quirky, symmetrical chandelier like the one in the bedroom pictured here, adds contemporary charm to the space and gives out a spacious effect. However, this technique works best for narrow rooms with tall ceilings, as an oddly-shaped chandelier may take more space than you think! 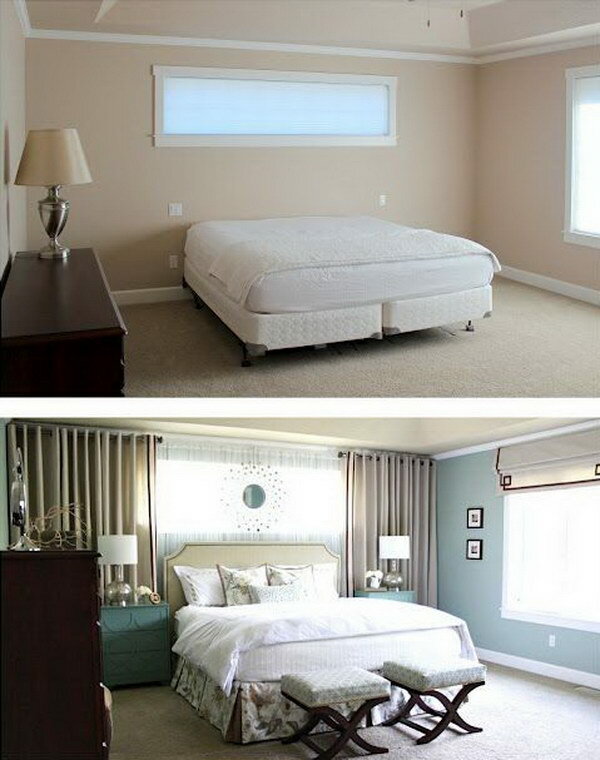 Hi, I would really like to know the paint color in the third photo “after” picture under “paint with light hues “. Thank you! Hi, Armelle! The paint color is the cool elegance by valspar. This is fantastic. We live in a tiny house in France and are in the process of redoing several things. I will keep these tips in mind. About two of those rooms are actually small. The rest are normal or even large. They are all beautiful, which is lovely. But if you are looking for ACTUAL, practical examples this isn’t terribly helpful. Gorgeous and chic, but not “small”. Exactly what I thought. I also love that all of these rooms seem to have an abundance of light coming in, which is not so typical of most houses I’ve lived in. I have 8′ flat ceilings (with a much needed ceiling fan). The room is a good size, but I only have a single 35×60 window. agreed, most of these don’t look small to me. some of the suggestions wouldn’t even fit in my current apartment’s bedroom (11’x11′) along with a queen bed. My thoughts exactly. All of the rooms are lovely, but this really isn’t helpful if you live in a bungalow that was built in 1929 as I do. Most of these are probably twice the size of my bedroom. Really cool color/pattern/texture combos though. BTW I can’t figure out who wrote this and that’s a shame because whoever it was deserves credit. I am busting at the seam with excitement and desire. I love all the spaces. Each one adds a blissful glam that I simply adore. I just wish I had the designs in my home. 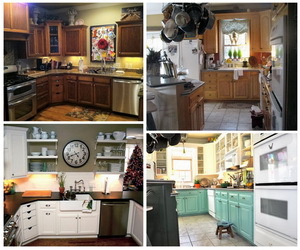 These are really great tips for staging to sell your home of just for living. Making smaller spaces feel bigger is a great way to maximize the potential in your home. I love your tips! The ideas are innovative and creative. HOOO MY G…THE ONLY THING THAT MISSING OUT IS ENOUGH ROOM AND SPACE TO RECREATE ALL THE IDEAS ABOVE …. WOW! So much valuable information! Thank you for sharing, I truly appreciate all of the hard work that went into this post. I will share with my daughter who just bought a new home. WOW! Great article! But it seems that no matter what you go with – weather a contrast or all neural, it all works together when there is cohesiveness and lots of light! These people know how to do design and that’s the most important part. I absolutely loved every detail in “mirrors can make a small space look bigger.” Can you please list where I can get all the furniture pieces that were shown and the beautiful chandelier. I also liked the neutral gray color on the walls.